On this terribly rainy day, Mom and I set out to do two things - see the Ben Affleck directed movie Gone Baby Gone, and have dinner at the Old Grist Mill Tavern. We did neither. At the last minute, Mom decided that she wanted to go shopping at the Ann & Hope Curtain & Bath outlet in Seekonk, MA. It was then that I decided where our dinner stop should be - the highly recommended (by my lovely aunt Judy and new friend Liz) Chardonnay's Restaurant, which was about two minutes up the road from the outlet. I'm thankful that the above picture even came out clear because it was raining so hard when we walked in at 4:10 p.m. We parked in front of the restaurant, but parking is available in the back. When we walked in, we were greeted by a young man who asked us if we were going to have dinner. We said yes, and he led us to a table to the far left of the restaurant, almost completely behind two large brick poles. I chose the seat facing the bar so that I could take a photo of the interior. The young host left us with two large, plastic menus and told us that our waitress would be joining us shortly. After speaking with Liz, I kept two things in mind. The first was to order the Pizza Bianco, which is a mashed potato pizza that Chardonnay's had previously placed on a list of specials, but can still be ordered if you so choose. Liz absolutely raved about it. The second thing that Liz mentioned was a waitress that she has become familiar with - Michelle. Michelle has been a waitress for Liz on quite a few occasions, and has always provided her with fantastic service. Before I knew it, I looked up from my menu and a waitress was approaching. Lo and behold, her name was Michelle! What luck, I thought. Michelle took our drink order. Both Mom and I ordered two Diet Pepsis, which promptly arrived in two glasses. Michelle then gave us a few minutes to decide. Although the prices are a bit steep at Chardonnay's, there is certainly a lot to choose from. Once Mom had made her decision, and I decided on a backup in case the Pizza Bianco was not to be, Michelle came back to take our order. 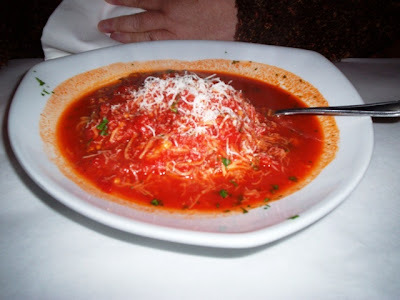 Mom went with the Capellini Marinara ($15). I then explained to Michelle that a friend had recommended the Pizza Bianco. She knew what I was talking about and informed me that the pizza would be $10. After giving my approval for the Pizza Bianco, she took our menus and left the table, giving Mom and I a chance to scope out the dining area. Chardonnay's appeals to all ages. It is both trendy and modern for Liz, while being classy and sophisticated for Aunt Judy. 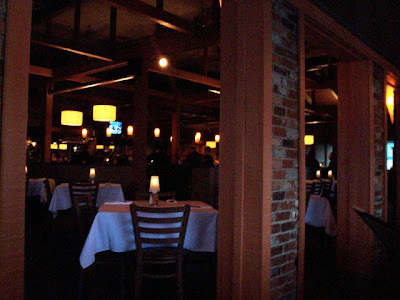 With the low lights, dark woods, brick poles, and exposed piping above the bar, Chardonnay's has a very relaxed environment. The waitstaff was dressed in black uniforms, while the tables were dressed with white tablecloths and white cloth napkins. To maintain easy cleanup, each table top was lined with a sheet of butcher paper, and a small lighted lamp gave every seating area a warm glow. There are no booths here, but the tables were far enough apart where all diners could have some privacy while they were eating. A large bar stood at the center of the room surrounded by modern chandeliers and high bar stools. Since the weather was so lousy today, the surrounding windows were shaded by wooden mini blinds, while the R&B music playing in the background - although it seemed a bit out of place - was slow and soothing. At first I was a bit confused as to why Mom and I were seated as far away from the other patrons as possible, and behind a large pole. Why couldn't we sit where all the action was? There seemed to be a bit of a crowd around the bar area and front entrance. Mom told me that it was probably because we were there to have dinner, and not just hang around at the bar eating appetizers. After thinking about it for a few minutes, I decided she was right. After all, I was wet from the rain and wearing sweat pants. I was kind of glad that no one could see me. The menu at Chardonnay's puts a modern spin on classic dishes, which is a welcome change from the average food found at most of the local chain restaurants. Appetizers range from a cup of soup du jour ($4.75), to a plate of 10 grilled clams ($12.25) that are grilled in their shells and drizzled with garlic herb butter. Sandwiches include the steak sandwich ($11.75), which features a grilled top sirloin sliced and topped with sauteed Portobello mushrooms, caramelized onions, and Swiss cheese. This was going to be my backup meal in case the pizza I wanted wasn't available. All sandwiches are served on a bulky roll with your choice of mashed potatoes, French fries, jasmine rice, or sweet potato fries. For salads, you can choose from the antipasto ($9.75 small; $13.75 large), the Ultimate Wedge ($7.75), or something more exotic like the pear and Gorgonzola ($10), or the scallops and black bean ravioli ($18.85), which features pan seared scallops and black bean ravioli over greens with salsa, jalapeno sour cream, and pineapple vinaigrette. You can add sausage ($1.50), grilled Portabello mushrooms ($2.25), four grilled shrimp ($5.25), or an 8 oz. grilled chicken breast ($4.25) to any salad. Pizzas include the Cabo ($11.75), scampi ($12), and the Caesar pizza ($11.25) which is basically Caesar salad on a pizza. You can add sausage or diced chicken for an extra $1.50 per item. Chardonnay's also offers a "take and bake," where you can take home fully assembled pizzas and bake them at home in just nine minutes. Entrees include Clams Portuguese ($19), shrimp scampi ($18.50), sesame tuna steak ($20), Chilean sea bass ($23.25), grilled Filet Mignon ($24.25), and the seafood sautee ($27), which includes shrimp, scallops, and Alaskan king crab legs sauteed with butter and sherry over jasmine rice with roasted asparagus. Fish entrees are served with mixed greens and jasmine rice, while meat entrees are served with mashed potatoes and the vegetable of the day. Chardonnay's also features a sushi menu with items like the Tuna Nigiri ($6.25), California roll ($7.75), and a combination plate of four pieces each of California and spicy tuna rolls ($8.75). If you would like bread with your meal, it is available upon request. Chardonnay's also has a very large wine list along with a large list of beers both on tap and in bottles. 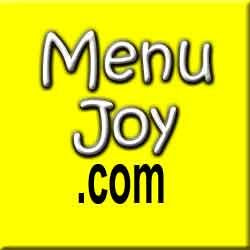 There is also a party menu for private parties of various sizes, and an 18% gratuity will be added to groups of eight or more. Michelle returned to our table to inform us that because my mashed potatoes were the first of the evening, it was going to be about two minutes longer. This was not a problem. I was honored to have the first batch of potatoes. I am almost positive that we only waited another two minutes before our meals arrived. Brought over to us by a blonde waitress, both dishes looked absolutely amazing, and smelled even better. She asked Mom if she wanted some grated cheese on her pasta, and she did. The waitress gladly grated the cheese and left us to dig in. Mom, after remarking that the pasta had better be good for the price of $15, loved her meal. It was steaming hot, and that is always a plus in Mom's book. The capellini was cooked perfectly and was nicely al dente. The sauce was delicious - tangy, with a hint of sweetness. It had a great fragrance. As a matter of fact, I kept remarking on how good it smelled from my side of the table. You could tell it was freshly made, and neither too thick nor too watery. The portion was adequate, but it was so good that Mom wished there was a little bit more. 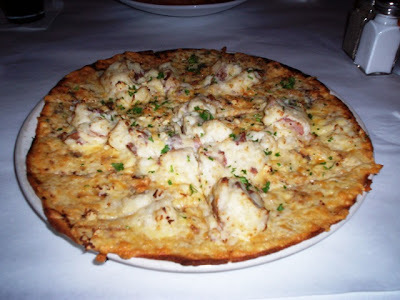 I have only one word to describe my mashed potato pizza - unbelievable. It is unbelievable because I had never seen globs of mashed potatoes served on a pizza before, and unbelievable because the taste was out of this world. The base pizza was white, flavored only with garlic and a delicious blend of cheeses. The crust was thin and buttery with a perfect crispy texture. The mashed potatoes appeared to be garlic red potatoes that included the skins, and was served in a small pile on each piece of pizza. The pizza was not cut into triangles, but cut into slivers, allowing me to have about 10 long strips of pie. Before each bite, I made sure to spread the potatoes over the entire slice of pizza. The taste was fantastic. It was very simple, yet extremely flavorful. Mom even had a slice and thought it was great, and fans know what a plain eater she is! Liz was right - Michelle was an excellent waitress. We left $36.15 on the table for her (including 20% tip) and made our way to the back of the restaurant to use the ladies' room. The restroom has only one unit, which seemed to cause distress for one frantic woman who really wanted to get in there. The restroom was clean and organized, but we did see a sign outside that informed handicapped patrons that the restrooms were not accessible to wheelchairs. We left the restaurant at a few minutes before 5 p.m. We were full, happy, and so glad that we listened to Liz and Aunt Judy. Chardonnay's is both an elegant and casual restaurant with delicious food and great service. Like I mentioned earlier, the prices are a bit on the high side, and that is why we've given it four hearts instead of five. However, on our next visit, if the meal is as good as it was today, Chardonnay's will definitely be ready for the move from "very good" to "excellent." Mom and I are already planning our next meal. 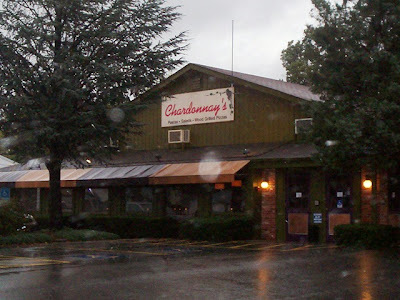 Chardonnay's is open from 4-11 p.m. Monday and Tuesday, and 4-11:30 p.m. Wednesday through Saturday. On Sundays, brunch is available from 10 a.m. to 2 p.m., and dinner is available from 3-11 p.m. Chardonnay's also has two sister restaurants - the Meritage in East Greenwich, RI, and Chardonnay's Cafe in North Providence, RI. Please check out their Web site for more information.